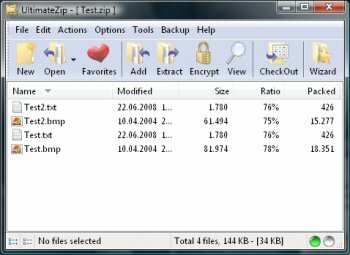 UltimateZip is an archive utility that features built-in compression support for Zip, Blak Hole, Cabinet, Jar, Lha, GZip, Tar and Tar-GZip archives. It has built-in decompression support for Ace, Arc, Arj, Pak, Rar, Zoo, Zip, Blak Hole, Cabinet, Jar, Lha, GZip, Tar and Tar-GZip archives. It also features built-in support for UUE and XXE encoded files, a zip and mail feature,. multi-disk spanning, archive and file encryption, repair broken Zip archives, a text viewer, archive converter, and more. zandres, et al, you do have to pay for this UltimateZip program after 30 days. I realize reviews are dated. However I wanted to set the record straight that after 30 days, you pay. I noticed at in the February 2013 (I believe) the license was free. It supports 7-zip format very well. You can create and extract 7-zip files. Besides, it's free, but has that annoying nag screen at startup. Very nice little utility with a nice features. Just 3 stars, because of that nag screen and cause there are some really good absolutely free alternatives. You have to pay for It, but it does not support 7z? Come on! I suggest 7-zip o peazip instead, you will be able to open any format and compress with a much better compression ratio, for free. As I see it, it has no chance: Less for more ($) is not a good choice. Works ok. Seems to be very similar to PowerArchiver! the shell extension within 'file' explorer. Very nice program. Love it! It´s like Winrar and Winzip combined together. Perfect for extracting rars and zips. I couldn't believe how bad this utility was. The UI is so bad I couldn't even figure out what it did for at least a day. Once I got the hang of it, I found it extremely kludgy. Then could not retrieve 2 out of 5 of my spanned archive files. Now that this is not free, it has to to compete against WinZip & WinRAR. LOW quality, not free at all and crashed when i created a TAR file. The software do also TAKE OVER all archive filetypes, on Windows XP you need to do registry changes to get it back to default ZIP files. I HATE applications that do this! Wasting my time. People that submit applications as "freeware" when they are shareware should be banned from the site! If this was a student project, I would give it an A+ but otherwise this is pretty useless. The world doesn't need Yet Another WinZip clone. If you're going to clone WinZip, at least add something useful. Support for WAR format but not for 7z? Gimme a break. Hm...NAG-Ware (= -1* ) not Freeware, btw. a good Tool. First: I knew this program since version 2.6 and after 2.7.1 I switch to another alternatives but this is a GOOD SHAREWARE program (like winzip random buttons "I agree" "quit"). Second: good alternatives (free)- Tugzip, IZarc, ZippHO, 7zip. I can't think of anything more senseless than rating a piece of software down just based on its licensing scheme. After all, good software is good software, regardless of price, and the same goes for bad software. But the REAL point is that UltimateZip 3.0 IS STILL FREEWARE for private use: "The license has changed to Shareware for commercial use and to Freeware for private use." UltimateZip is better than IZArc, which the kids only rave about because it's free.